Beacon Bluff P-Patch. Photo by Melissa Jonas in the Beacon Hill Blog photo pool on Flickr. Your volunteer labor is needed to help at a couple of work parties at Dr. Jose Rizal Park and the Beacon Bluff P-Patch on Saturday, June 12. Craig Thompson writes to tell us that The Filipino-American Association of CPAs will have a work party in Rizal Park on Saturday at 9:00 am. They will be working in the upper area of the park. Neighbors are welcome to pitch in. Neighbors are also welcome to help at 10:00 am or so on the same day, when volunteers will create a new planting bed at the nearby Beacon Bluff P-Patch. 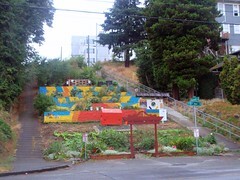 The P-Patch is located at South Massachusetts between 14th and 15th Avenues South. Last Saturday, a Seattle Works volunteer team came to the Dr. Jose Rizal Park off-leash area to build a barricade around the wet patch in the park and make it more dog-friendly. Craig Thompson sent us some photos and a report on the project. This is the structure that we built on Saturday down at Jose Rizal Park. At its center is the pond, then a ring of concrete blocks, then a band of salmon berries, then the corral of wood. It stands 4-5 feet high, and measures about 25 feet across and 3 feet thick. It incorporates only objects from the site. When I do work like this, I have Andy Goldsworthy in mind. This is a multigenerational piece. The corral will be taken by the elements. The band will fill in quickly, protecting the pool from those of the canine persuasion while providing berries for birds and neighborhood pies. The ring will stabilize the pool, and should the pool become a sustainable pond, it can be stocked with the lowland Pacific tree frog. The drainage should work to prevent mosquitoes and other blood suckers, though a woman did comment today that it made her wonder if it would be used for sacrifices. People will play with it—repairs should be easy. It will be interactive—might make a nice bonfire, too. 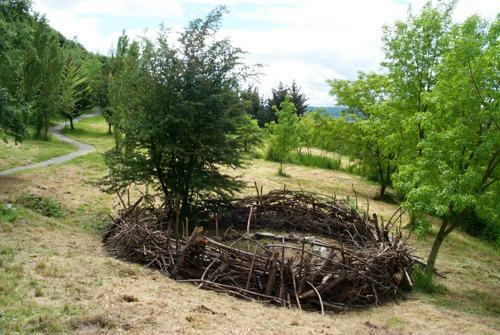 There’s a shortage of mid-level brush to host songbirds in Seattle Parks and woodlands generally, so this installation will likely draw them. Dogs can’t get all muddy there anymore. Besides building the corral, we also repaired the fence just east of it. 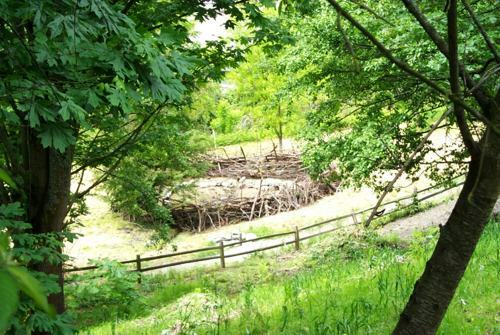 Most of the wood came from a pile that was near the view area of the lower meadow, so that area now looks more open, too. We also improved the drainage in the meadow – that is a much bigger task. We had over 40 Seattle Works volunteers, plus five neighbors. I divided them into three teams—one of the pix shows about a third of the group. All in all, a darn fun project. Check it out if you have a moment—looks medieval! 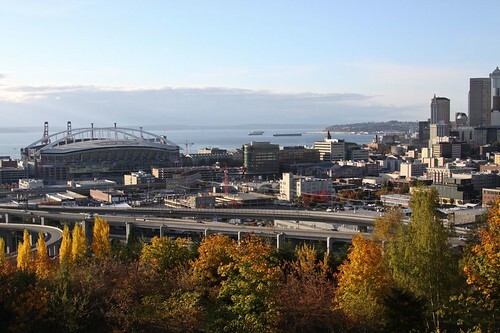 Saturday, May 22, a Seattle Works team will help construct a barricade around the wet spot downhill from the spigot in the Dr. Jose Rizal Park off-leash area. This is the fourth year in a row that a team has celebrated Seattle Works Day at the park. We chose this project as we learned from several people that they don’t bring dogs to the OLA because of the wet spot—dogs roll in the mud, have to be washed, etc. The event Saturday starts at noon and lasts till 4:00 pm, with setup beginning around 11:00 am. We have all tools we need, but we could use more people, as we’ll be moving a brush pile from the bench/view area to the wet spot. We’ll also be planting salmon berries within the barrier, as they’ll provide a natural barrier to the site once the brush decomposes in a few years, plus salmon berries are heavenly. 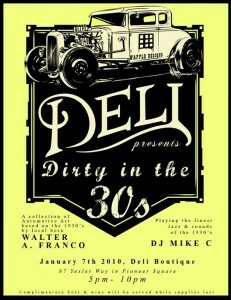 There’s a huge party after the event—details and location are at the Seattle Works website. 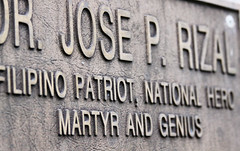 Dr. Jose Rizal Park is located at 1008 12th Avenue South. 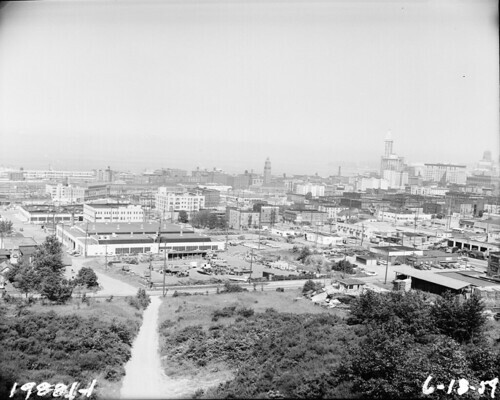 A view of downtown and what is now the stadium area from North Beacon Hill, 1959. The most visible buildings are King Street Station and the Smith Tower, though other recognizable buildings still exist today. No freeway yet! Photo courtesy of the Seattle Municipal Archives. A relatively close match to the 1950 view, taken in October 2008 by Bridget Christian, and found in the Beacon Hill Blog photo pool on Flickr. The camera is pointed slightly more to the left than in the old picture. You can still see the King Street Station tower here (partially hidden by another building) and the Smith Tower is still here as well, but blends a bit into the building behind it. Neither building dominates the modern view like it did in the 1959 view. Saturday, January 16, EarthCorps, Seattle Parks & Recreation, and the Seattle Green Partnership will kickoff the Martin Luther King, Jr. Birthday / King County United Way Day of Caring volunteer events at Dr. Jose Rizal Park. The event runs from 10 AM to 2 PM, with set up beginning around 9. Around 50 volunteers are expected, who’ll work on planting 300+ native plants and doing maintenance work on previously cleared areas, and continue reclaiming the southwestern slope of the area for restoration. If a few neighbors come, we can move some logs and improve the trail into the area, too. And on Sunday, January 17, in case you can make it, at Dearborn Park off Othello Orcas, there will be another event, from 10 AM to 2 PM. A second Beacon Hill event will take place on Monday, January 18, with 300 volunteers (!) coming to the Cheasty Greenspace on the east side of the hill. Sponsors include EarthCorps, the Green Seattle Partnership, Service for Peace, City Year, YMCA Earth Service Corps, University of Washington, and Seattle Parks and Recreation. This is the “signature” event for the MLK Day of Caring volunteer events in Seattle’s south end. Following the event will be a service appreciation reception at Jefferson Community Center, which is a great opportunity to network with volunteer agencies doing on the ground work on Beacon Hill. The Beacon Hill events are on our event calendar, as well. Thanks Craig! And thanks for the correction, Deborah! 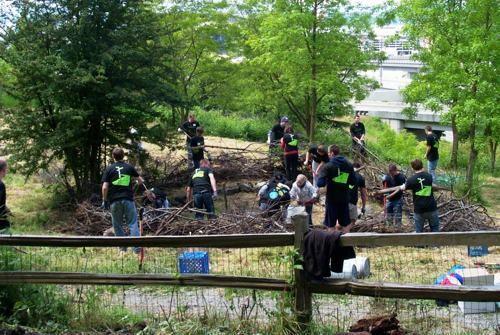 Friday, 90 volunteers completed the access project through the woods of Dr. Jose Rizal Park. This opens the forest with a defined pathway to the south of the off-leash area fence, running for approximately 1/4 mile. It gives access to police, fire, and emergency personnel, and to restoration crews. The project — which was endorsed by the community in a large public meeting in 2005 — was made possible by a coalition of state and city agencies and community groups. It’s been six years from planning, four years from first boots on the ground. Over 8,000 hours of volunteer time made the project happen, plus grants from King County and the City of Seattle. About 60,000 square feet of ivy and non-native blackberry bramble have been cleared from the ground; 1,000 trees now have ivy control measures protecting them, including trees south of the park for several city blocks. Over 1,000 native species have been planted. An apple orchard of some dozen trees has been reclaimed. On Friday, besides the pathway, 145 native plants were planted in an area just uphill from the gateway to the off-leash area off the access road. Another 750 bulbs – tulips and daffodils – were planted on the slope beneath the parking lot overview; this brings the total to 1,600 bulbs planted as interim cover before native plants are brought in. Also, a dozen native rose bushes were planted in this area. At the entrance to the off-leash area, just inside, we cleared non-native grasses and then spread cardboard over previously bare soil and covered it with woodchips to create erosion control; we can plant native species later. A total of 15 cubic yards of woodchips were used along the pathway, the native planting area, and at the entrance to the OLA. EarthCorps has been instrumental in providing a large base of support for the work, as has King County United Way. This makes the third year in a row that large crews from Microsoft stepped up to make a difference. I’d like to thank Lynn Tucker, my wife Ariel, and four other Beacon Hillers who came out to help this year. I’d especially like to thank former Hillers Wayne Rennick, Dean Olson, and Kevin Kelley, too, plus my neighbors Dee, Paul, and Lynn for keeping so much going, and everyone who has spared a morning or afternoon. Our first annual “Top of the Hill” survey is still open for a while yet, and we’re not releasing results until it closes, but there has been one fairly frequent answer that I’ve noticed. One of the questions is “What is your favorite public art on Beacon Hill?” and while most people do have a favorite, there has been a surprisingly large number of people who say they don’t know of any public art up here. 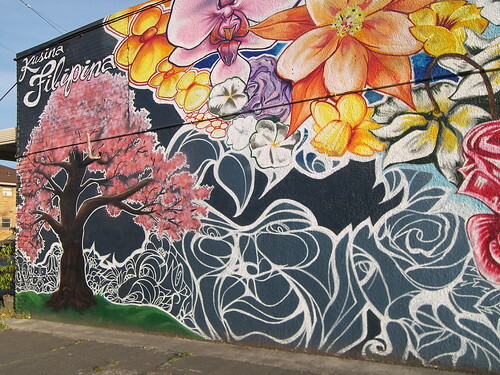 While we may not have as much obvious public art as some neighborhoods, we do have a fair amount. 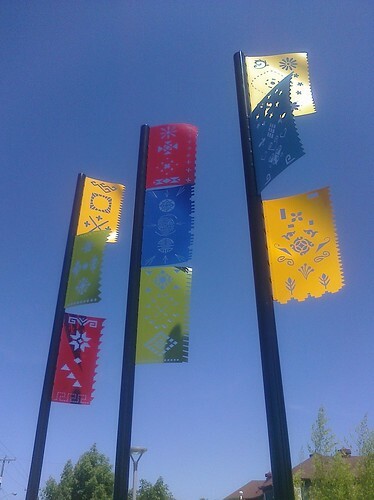 (The number probably doubled with this year’s addition of the Link station and its multiple artworks.) Here’s a collection of images of some of the art we all enjoy on Beacon Hill. Many of these photos are from the Beacon Hill Blog photo pool on Flickr. Have any photos you’d like to share? You are welcome to contribute them to the pool. The mural on the side of Kusina Filipina. Photo by l0st2. Mosaic in Dr. Jose Rizal Park. Photo by Seattle Daily Photo. In front of the light rail station. Photo by l0st2. 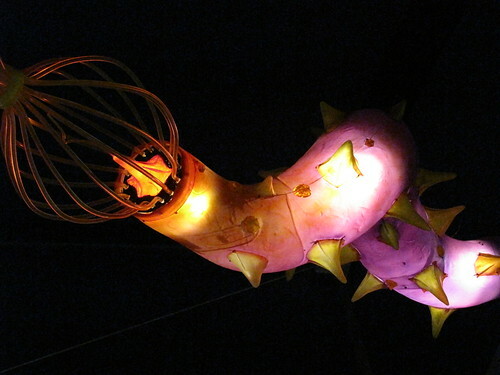 One of the "creatures" inside the Beacon Hill Link station. Photo by Wendi.